(Nanowerk News) Optical engineers from ITMO University in Saint Petersburg developed an express method for estimating the distribution of particles in optically transparent media, based on correlation analysis of holograms. As a big part of the study, they had created an algorithm capable of image processing in a few seconds. The new method can be applied to engineering devices for monitoring metal shavings in the engine oil, studying a plankton in water, or tracking viruses in living cells. The work was published in Scientific Reports ("Correlation Characterization of Particles in Volume Based on Peak-to-Basement Ratio"). Typically, holography is associated with three-dimensional images of museum relics, souvenirs, marking products and protective signs. But it is also used in industry for studying the roughness of surfaces and deformations in products. In the new study, scientists from ITMO University Tatiana Vovk and Nikolay Petrov developed a method for express analysis of the distribution of microscopic particles in transparent media. 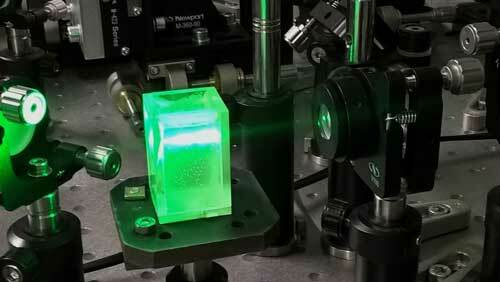 The approach is based on Gabor holography, the simplest and historically the first type of holography. The experimental results processed by computer simulation software showed that the developed method allows one to quickly appraise the concentration, average diameter and transparency rate of particles in a sample media. Tatiana Vovk, researcher at Department of Photonics and Optical Information Technologies of ITMO University comments: “There are many ways to visualize particles in suspension or aerosol, as well as methods to process these images. But they take quite a long time, and some cannot cope with analyzing media with high concentrations of particles. Therefore, our goal was to make an express method that could examine samples with any quantity of particles in real time and could be ready for industrial implementation”. As of now, the scientists showed the basic operability of the method, but they believe that it will be useful in many branches of science and engineering. Basing on the study, engineers can build analyzing devices for real-time monitoring of the particle flows and, for instance, utilize them to determine the number of particles in the machine oil. “The friction in mechanical parts causes the release of metal shavings in the grease. They circulate with the oil and wear out the mechanism. The device could help to evaluate this wear level by investigating the pollution of the grease,” adds Tatiana Vovk. Biological applications of this technology are interesting as well. According to scientists, their method will allow one to study the purity of lakes and rivers through determination of the plankton transparency in water samples. This parameter, in turn, indicates the reservoir ecological state, since the optical properties of microorganisms highly depend on the habitat. The researchers are considering the possibility of adaptation of this technology for tracking the viral particles in living cells. “When exploring mechanisms of virus transport, scientists apply fluorescent microscopy. Such an analysis requires processing of large amounts of data. Our method can potentially help to quickly process these hundreds and thousands of images taken from a microscope. But we need the assistance of some biomedicine experts to solve arising issues and to carefully understand how to combine the fluorescence microscopy with digital holography in the most effective way,” says Nikolay Petrov, head of Digital and Display Holography Laboratory at ITMO University. To obtain the particles’ parameters, the researchers expose the sample with the collimated laser beam and get the digital Gabor hologram. Then they extract two flat images from the hologram. The focusing on these images is carried out by computational methods, a mathematical simulation. The fast image processing takes place by virtue of the correlation function. The researchers compare the images and thereby receive the needed information about the entire distribution of particles. Correlation analysis is widely applied not only in image processing, but also in statistical physics and other disciplines that study random processes. For example, it helps understand the correlation between the observed values and the types of particles released from collisions inside the Large Hadron Collider.